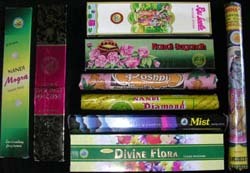 Made by the B. V. Aswathiah & Brothers company, these are a wonderful floral incense. "Nandi Brand" trademark aromas are world famous for their rich, penetrating scents. Clear floral blends with added spices, woods, resins and perfume oils. We have added this brand by popular request from our customers and are hard to find! Try something different today. NEW LOWER PRICES AND SAVE NOW by purchasing in case packs!